Logistics: This tour was in two parts. Part one covered Cairns and the Atherton Tablelands and part two, the Musgrave and Archer River areas and Iron Range. In part one, we stayed at the Harbourside Holiday Inn in Cairns, Chambers Wildlife Lodge and Kingfisher Park on the Tablelands. Part two saw us at Musgrave and Archer River Roadhouses for one night and the Iron Range Cabins at Lockhart River Airport for four. We travelled in three four-wheel-drives. Trisha used one of those exclusively as the food truck, an excellent Isuzi D-Max twin cab with a 100% dust-proof aluminum canopy, hired from Meteor in Cairns. While being a late addition to the tour planning, we were fortunate to have Robert from the Plains-wanderer property join the team. Robert drove a comfortable Mitsubishi Triton 4WD with canopy that was anything but dustproof, again from Meteor. While having never birded in Far North Queensland before, Robert was no less than brilliant. I drove a 1300Truckhire basic but new Toyota Landcruiser that I’d collected in Cairns before the Gulf of Carpentaria tour and kept for both tours. We had on board, veteran AOS tour participants, Jeannie and David (Canberra) and Robert’s father, John (Hay plain, NSW). Jeannie, David and John were with us for the long haul, having done the Gulf tour prior to this tour. We also had Sue (Victoria), Kim (ACT), Susanna (Tasmania), Jim (ACT) and Jacqui (Victoria). Sue, along with her husband Roger and her parents, were our first paying customers some thirty plus years ago! Susanna, while being relatively new to AOS, has become a regular and much valued tour participant, having done three major tours in three years. We started our tour on the Cairns Esplanade. Despite the development that has gone on there in recent years, it’s still a great spot for birds. The tide was at optimum height and had pushed the shorebirds up close to shore. The highlight was a couple of double-banded dotterels, one of which was pretty much in full breeding plumage. Other waders added to our list here included red-capped plover, a couple of lesser sand-plover, about ten greater sand-plover, bar-tailed godwit, whimbrel, far eastern curlew, greenshank, grey-tailed tattler, great knot and red-necked stint. Happy with our swag of waders we turned our attention to other species. The rollicking song of the varied honeyeater was ringing in our ears as we headed for the mangroves at the northern end of the Esplanade. At this point, while scanning along the shoreline, Robert spotted a great-billed heron feeding in the rising tide out from the mangroves. Wow, what a bird to get on our first morning! We watched it through the scope for about ten minutes before the water became too deep for it and it moved closer into the mangroves and out of view. But our luck didn’t stop there, a little further along John spotted a single beach stone-curlew roosting in close to the mangroves. This is quite a difficult bird to get around Cairns. In the mangroves we soon added mangrove robin and collared1 and sacred kingfishers to our list. We were just about to load up the vehicles when a pair of double-eyed fig parrots flew in over our heads and landed in a nearby tree. While looking at the fig parrots an immature rose-crowned fruit-dove was spotted feeding nearby in the same tree. The Esplanade wouldn't stop giving! We moved on to a nearby park where a pair of rufous owl has taken up residence. Here we ticked off one of the owls high up in a fig tree. It appears the other owl has started incubation in a nearby eucalypt so hopefully the pair will successfully raise young. Our next stop was an area of vine scrub and mangroves not far out of Cairns. I was hoping for white-eared monarch as I had seen one here when I was doing some pre-tour reconnaissance. The first bird seen, as we alighted the vehicles, was a magnificent jabiru2 flying overhead. This species looks so good in flight. The birds were coming thick and fast in the vine scrub. Surprisingly we saw a brown-backed honeyeater, a species that is usually much further north at this time of year. Other species included leaden flycatcher, yellow, yellow-spotted, graceful and dusky honeyeaters, helmeted friarbird, olive-backed sunbird, mistletoebird, yellow oriole and spangled drongo. After some searching we located a pair of lovely fairywren; the female particularly lovely, with her pale blue head and white around the face and throat. Our next bird was a monarch, not the white-eared we were after but the black-faced. This also surprised me a little as this species winters in PNG and is not usually present at this time of year. Still with all the weird weather we get nowadays, it’s little wonder the birds are getting mixed up. A broad-billed flycatcher was seen in the mangroves and finally in some adjoining vine scrub, we found our white-eared monarch. The next stop was Centennial Lakes where Trisha had lunch waiting. We set off for a post-lunch stroll about the gardens and located the pair of Papuan frogmouths that hangs out there. Our other target bird here was little kingfisher and we had almost finished our circuit of the lake before we found one. Our stroll also afforded us black butcherbird and orange-footed scrubfowl. It was time to start heading up to the Tablelands to Chambers’ Wildlife Lodge. As we left Cairns a crew of bush stone-curlew was observed beside the highway. Halfway up the mountain we stopped in some dry eucalypt forest but only added yellow-faced honeyeater to the list. After dinner we checked out the feeding are at Chambers for possums and gliders but just as we arrived, the striped possum was disappearing at great haste up a tree. We did have nice looks at sugar glider. On the lawn nearby a few of red-legged pademelons grazed. First up we birded about the lodge and soon had quite a few of the Wet Tropics endemics on our lists. Species seen included spotted catbird, Victoria's riflebird, grey-headed robin, pale-yellow robin and Bower's shrike-thrush. A fig tree was in full fruit behind the lodge and about half a dozen double-eyed fig parrots were showing themselves off to good effect while feeding on the fruit. Varied trillers were also about. Our first brown gerygone, large-billed scrubwren, and the northern race of red-browed finch were also seen here and topnot pigeons flew over. Chowchillas could be heard calling in the distance. In a flowering grevillea by the lodge we had nice looks at Macleay's honeyeater and eastern spinebill. We moved down the road a bit towards Lake Eacham where we birded more mature rainforest. It was a bit quiet to start with but eventually we had nice looks at eastern whipbird but our best sighting for the morning was a male Victoria's riflebird in full display on quite a low perch right beside the track. Wow! Not surprisingly, he attracted a female in to have a look. After this, a northern dwarf-crowned snake showed us just how fierce it could be even though it was less than two-foot long. It reared up at us after I almost stepped on the poor little guy. After this excitement we located the wompoo fruit-dove sitting on a nest not far above the track that we had found on the Gulf of Carpentaria tour a week before. Nearby we had our first sighting of the delightful yellow-breasted boatbill, followed soon after by our first pied monarch. The walk back produced golden whistler and about half-a-dozen of the northern race of crimson rosella, not such a common bird in the Wet Tropics. The small northern race of white-throated treecreeper was also encountered on our walk. We were well pleased with our morning’s birding so we headed back to the lodge where Trish had lunch ready. Following a post lunch siesta, we headed across to Lake Barrine where I was hoping we might connect with the elusive chowchilla, one of the more difficult of the Wet Tropics endemics. It proved to be fairly quiet over at Lake Barrine and I didn't think we were going to add anything at all to our list. Eventually we located a male wompoo fruit-dove and were tickled watching it make its deep baritone wom-poo call. After a while it flew up into a nearby tree and appeared to drink from a tree hollow that apparently held water. The wompoo moved off a bit and, as we continued to watch the hollow containing water, a female superb fruit-dove flew in and landed near the hollow. It didn't stay long but as we watched, a male superb fruit-dove suddenly flew in and landed on a bare limb in full view. We were mesmerized by this stunning bird appearing in full view so close. A great end to the daytime birding even though we didn't see a chowchilla! Spotlighting tonight was rather frustrating as we heard two lesser-sooty owls call but both refused to be seen. Many boobook owls were calling but they also declined to reveal themselves so we couldn't discern if they were the so-called red boobook3 or the regular southern boobook. A couple of northern brown bandicoots were seen on our night drive. Back at the lodge we had great looks at the striped possum at the feeder and more sugar gliders and six or so red-legged pademelons. We birded around the lodge first thing this morning and had good looks at spotted catbird and Victoria's riflebird and seeing both shining bronze-cuckoo and fantail cuckoo. The fig-parrots were again about as was Bower’s shrike-thrush. One of our group spotted a white-headed pigeon on the roof of the lodge, the only sighting for the tour. We didn’t stay long at the lodge as we had other quarry to seek over at Mount Hypipimee. At a citrus orchard, not far from the lodge, we stopped to marvel at around thirty bush stone-curlews roosting under the citrus trees. Amazing how this species can adapt to humans and how common they can be if the European red fox isn’t present; and sobering to think we’ve all but lost them from southern Australia. Also of interest was a beautiful mistletoe in flower (one of the creeping mistletoes, I believe) growing on the citrus trees. It was once unusual to see any species of mistletoe growing on a non-native tree but it’s becoming more common as the mistletoes adapt. We called in at a park on the river over at Malanda that often has a few birds of interest. This again proved to be as we located a tooth-billed bowerbird feeding in a rainforest tree by the creek. The bowebird was a surprise as I had never seen one away from sizeable areas of rainforest and this was just remnant rainforest along a river and at quite low altitude. I have since heard that a golden bowerbird has recently been recorded in a similar situation, so perhaps both species are becoming more adventurous. We continued on through Malanda heading for Mt Hypipimee. A raptor was spotted just to the west of Malanda that proved to be a square-tailed kite, a good find as this species is becoming a greater challenge. Our luck did not finish there as on the drive over to the Crater, David spotted a magnificent male Lumholtz's tree kangaroo sunning itself at eye level in a roadside tree in a remnant patch of rainforest. What a creature! Finally, we arrived at Mt Hypipimee. It was quiet at Mt Hypip as it often is and we worked hard for our birds. With some effort, we had some half decent views of fernwren and Atherton scrubwren as well as satin bowerbird — not a common bird on the Tablelands. After another lunch prepared by Trisha in the picnic area, we worked the entrance road. Here we had poor looks at mountain thornbill and better views of large-billed scrubwren. We ventured into the rainforest where we located another tooth-billed bowerbird and had much better views of a pair of Atherton scrubwren. We checked out the golden bowerbird’s bower but there didn’t appear to be a lot of activity there as yet. It didn’t look as if we were going to see a golden bowerbird and we may not have if not for a Tasmanian birder whom we had just met. We were watching some mountain thornbills in the car park when he called out that there's a pair of golden bowerbird in the tree over here. We bolted over and found the female quickly and eventually the male. Another tooth-bill was also feeding in the same tree. After this great success we decided to move on. I had been hoping a cassowary might turn up as we had seen an immature bird here on the Gulf tour only a week ago but our time at the Crater was up. Our next stop was in some dry remnant eucalypt forest not far out of Atherton. While we were en route from the Crater, two red-backed kingfishers were spotted on power lines in an area that would normally be considered too wet for them. With drought still raging in much of Queensland and poor wet seasons on the Tablelands, anything is possible. Quite a few birds were added to our lists in the dry eucalypt forest and adjoining swampland. On the swampland both sarus crane and brolga were seen as well as swamp harrier and pink-eared duck. In the dry eucalypt forest and farmland we had the beautiful northern race of eastern yellow robin with the breast and rump so much brighter than our race in the south. The eucalypts were in full flower and small flocks of scaly-breasted lorikeets and some rainbows were continually coming and going. In a house yard adjoining the road the owner had several birdbaths set up and in the late afternoon the honeyeaters and other birds were pouring in. The honeyeaters consisted mainly of white-naped, white-cheeked and yellow -faced but eastern spinebill, dusky and white-throated were also seen. Many scarlet honeyeaters were feeding up high in the eucalypt flowers but didn't come down to bathe. The last bird we added to the list here was the beautiful Atherton race of white-browed scrubwren with its stunning white eye. The sun was getting low in the sky now so it was time to head for Kingfisher Park. The drive over to Kingfisher produced our first blue-faced honeyeaters, wedge-tailed eagles, Australian hobby, red-winged parrots and red-tailed black-cockatoos, as well as white-bellied sea-eagle right at the turnoff to the Park. That’s what I call a superb day’s birding in North Queensland! We started off our morning with porridge and bacon, eggs and tomatoes on the veranda at Kingfisher Park. It was fun watching the birds have their breakfast, which Carol, the mistress of Kingfisher Park, had put out for them. Dozens of red-browed finches and chestnut-breasted mannikins fed at the feeders while underneath scrubfowls and brush turkeys took their turns. Emerald dove was also about as were the cute pale-yellow robins. After breakfast we took a walk about the Park. Some of our best sightings here included rufous fantail, fairy gerygone, pied and spectacled monarch and an immature tooth-billed bowerbird. Carol thought the tooth-billed was only the second record for the Kingfisher Park. But the pièce de résistance was a noisy pitta that came out on the lawn right in front of us! What a bird! We had fun sorting out the yellow-spotted and graceful honeyeaters and more Macleay’s were seen. When the possibilities were largely exhausted we headed for Mt Lewis. We had not gone far down the road when a superb grey phase grey goshawk was spotted sitting on an electricity pole beside the road. Wow! Once common on the Tablelands, this species seems harder to see in recent years. We really only had two target birds up Mt Lewis: fernwren and chowchilla. We’d seen a fernwren at Mt Hypipimee but not everyone had had an excellent view of it. It was hard going up the top of Mt Lewis, as it often is. We walked one way down the track and saw practically nothing and were hoping the return trip would be more productive. We had not gone far when someone heard leaves being shuffled and sure enough a group of chowchilla was discovered trying to hide in leaf litter! Great views were had before they moved off. A little further along an Atherton scrubwren was spotted feeding on the track. As we manoeuvred for position a fernwren was spotted and we turned our attention to it. It was very co-operative and everyone had some nice views of this often-elusive bird. Other sightings along here included brown gerygone, large-billed scrubwren and some folks briefly had yellow-throated scrubwren. We also had brief sightings of a couple of musky rat-kangaroos, one on our walk and another scootered across the road on the way down the mountain. Mt Lewis had been kind to us after all. After lunch back at Kingfisher Park, we called in at a patch of rainforest where there had been recent sightings of the highly desirable blue-faced parrot-finch. Many eucalypts were flowering in the vicinity and attracting lots of honeyeaters and lorikeets. The honeyeaters here included many bridled, which was one we were still missing. White-cheeked and yellow-faced were also common here and scarlet could be heard calling from the treetops. Scaly-breasted and rainbow lorikeets also screeched overhead. No parrot-finches were forthcoming so we continued on our way. Our next stop was Mt Molloy where we added great bowerbird to our lists as well as better looks at blue-faced honeyeater. Our last stop for the day was Lake Mitchell. Along the highway near the lake, Robert spotted a road-killed northern quoll. I have not seen a quoll dead or alive up here for over twenty years. Perhaps they are making a comeback after being knocked about by the poisonous cane toads. Our first pheasant coucal was also seen on the drive into the lake. The lake offered little apart from comb-crested jacana, magpie goose and the usual egrets and herons. We headed back to Kingfisher Park. Trisha had dinner prepared for us on the verandah and my old mates and Northern Queensland birding legends, Lloyd and Del, joined us for a meal. Later we watched the fawn-footed melomys and northern brown bandicoots come out for the tucker that Carol had put out for them. We breakfasted with the birds again on the Kingfisher Park veranda. Today was the last day of our Tablelands’ section of the tour. We would be saying goodbye to Jim and at the end of the day we’d welcome Jacqui who was joining us for the Iron Range leg of the tour. We arranged to meet Trish in Kuranda for lunch after which she would take Jim down the hill to Cairns and collect Jacqui. We tried the patch of rainforest up the road from Kingfisher for the parrot-finch but came up with the same result as the previous day. Moving on, we headed north-east of Mareeba to a road that Lloyd and Del had told me about. These titans of FNQ birding were on the money and we had many cracking birds down this road. Our main target bird was white-browed robin, a species burnt out of other well-known sites about Mt Molloy and Mareeba. We managed to see the robins on our first attempt and had cracking views of a pair of these delightful little birds. Nearby Kim spotted a fantail that turned out to be a northern fantail, another first for the tour. Walking down the road a bit we had a pair of lovely fairy wren. Sittellas were heard calling here but got away before we could get a look, which was a shame as they would have been the beautiful striated form where the female has the all black head. Other birds of note seen along the road were fairy gerygone, spectacled monarch, varied triller, shining bronze-cuckoo, white-throated honeyeater, yellow-breasted boatbill and olive-backed oriole, which was a new trip bird. Strangely enough, no grey whistlers were seen, yet when John and I had done some reconnaissance here a few days previously it was the most common bird we saw. Well pleased with our morning we headed to Kuranda to meet Trish for lunch and drop Jim off. During our lunch Susanna noticed a magnificent eastern water dragon sunbathing on a rock ledge just below where we were picnicking. We went for a short post-lunch walk along the Barron River in town. Birds were in short supply but we did see, up close, a magnificent green tree snake with its scales raised, which created a lovely pattern on its back. After this we headed back to our ‘magic’ road to see what else it could conjure up. Not far out of Kuranda we spotted another adult square-tailed kite soaring over the eucalypt forest. We drove further down the road this time into dry eucalypt forest. Here we had our first grey shrike-thrush and rufous whistlers. More brown-backed honeyeaters and eastern yellow robins were also seen. Some likely looking owl hollows were spotted from the road. Robert gave one a scratch and to our amazement out flew a red boobook owl! It just sat there and looked at us. No birds came to harass it so it was in no hurry to go back to its hollow. This owl is supposedly a resident of rainforest yet here it was in dry eucalypt forest. The only rainforest close was along a creek line. The other red boobooks I have seen have been in cleared farmland on the Atherton Tablelands. The red boobook is said to be smaller but we could not discern much difference in size of this bird than the birds we are familiar with in the south. Last year we saw a boobook in dense rainforest on Mt Lewis, which was just a normal looking pale boobook, not red at all. Red boobooks make no sense to me! Anyway, it is a magnificent bird and we were pleased to see it, particularly Sue, who had only three target birds — red boobook being one of them. A little further on we heard two owlet nightjars call and managed to lure one out of its hollow. It had chestnut cheek patches but otherwise looked similar to the birds we get in the south. In my experience, it is not an easy bird to see in the tropics. Our last stop for the day was in a patch of rainforest. A few days before, when John and I were doing reconnaissance, a fig tree in this patch had been full of figbirds and quite a few barred cuckoo-shrike. Now they were gone, presumably having cleaned out all the fruit. However, this time we had cracking views of musky rat-kangaroo. We made tracks for home now after a very exciting day’s birding. On our way back through Mareeba we had more bush stone-curlews and our first galahs. A paddock full of eastern grey kangaroos was seen on the northern edge of town. Back at Kingfisher Park Trish had dinner awaiting us and we met Jacqui who would be with us for the rest of the tour. We still had some unfinished business with lesser sooty owl so we went for a short drive. However, despite our best efforts we did not even hear one. It was officially declared a bogey bird and left at that. Robert's sharp eyes picked up some eye shine that turned out to be a female green ringtail possum with a baby almost as large as itself on its back! A barn owl was spotted along the road on our way home, so we did at least see one owl for the night. We were in bed in a timely fashion as we were heading up the Cape in the morning and had an early start. Day 6 Kingfisher Park to Musgrave. An early breakfast and then we hit the road — we had a long drive and great birds to find. The first bird we stopped for was a big male Australian bustard that Jacqui spotted on the roadside. It was a bit uneasy about us stopping. This bustard, one of the world’s heaviest bird species, lumbered into flight. Crested pigeons were on the wires about Mount Carbine and many Torresian crows were seen. Along the highway west of Mt Carbine, we had our one and only sighting of pallid cuckoo. We stopped at a dam a bit to the west of Mt Carbine. On the way in we saw our first squatter pigeons (red eyed form) by the roadside. At the dam we had a smorgasbord of birds and didn't know what to concentrate on for a while. More squatter pigeons were coming in to drink. Then the black-throated finches started arriving. Wow! We were transfixed. For an hour or so we watched them drinking and feeding about the dam, with at least fifty birds, both adult and juvenile present. However, we couldn't just watch the black-throats as there were so other great birds to take in, such as the beautiful black form of the brown treecreeper, with a family group present. This form is much more attractive than our brown treecreeper in the south and, being so different, you’d have to think it should be a candidate for a split. Other new birds for our list here included double-barred finch (white-rumped form), pale-headed rosella, white-throated gerygone, striated pardalote (the first actually seen), weebill (the lovely yellow form), apostlebird, rufous songlark, white-winged triller and little friarbird. Several great bowerbirds and many peaceful doves came in to drink. Our only euro sightings for the tour were also had about the dam. We didn’t see a male euro but the females were of a very grey coloration. They differ greatly in colour throughout Australia depending on the colour of the rocks around where they live. We still had a long drive ahead of us so reluctantly we moved on. Up about Lakelands we had sightings of black-shouldered kite and wedge-tailed eagle and our first noisy miners were seen along the road. We met up with Trisha in Laura where she had lunch waiting. We set off for Musgrave via Lakefield National Park, a route I had not taken before. Not far north of Laura, we had the first of many black-backed butcherbirds. Other species seen along the road included grey-crowned babbler, blue-winged kookaburra, red-winged parrot and collared sparrowhawk. Many bloodwoods and grevilleas were in flower along the road but strangely very few honeyeaters were present particularly smaller honeyeaters. The bird I was really hoping to find along this road was the white-bellied race of crimson finch, a form I’d not seen. Eventually we came upon what looked like good habitat for finches — tall grass along a pandanus-lined creek. And bingo, a flock of finches flew across the road. Sure enough, they were the white-bellied race of crimson finch. The flock of about thirty birds consisted of mostly juveniles and we had to search for full-colour adults. We were having some nice looks at adult males and females when suddenly an immature brown goshawk appeared and all the finches dived into the tall grass. The goshawk flew off but they could not be coaxed back up out of the grass. We went down by the creek and had nice looks at a pair of adults sheltering in some dead branches in the creek. Other sightings here included red-backed fairywrens. Continuing north, we encountered a tremendous flock of red-tailed black cockatoos that stopped us in our tracks. We estimated there were at least a thousand birds present and the noise was incredible as they took off and landed. Some large patches of bull dust were encountered through the park and it was a lot slower going than I had anticipated. The sun was sinking in the sky and we still had quite a few Ks in front of us before Musgrave! We finally hit Nifold Plain so I knew we were getting close. The plain produced our first spotted harrier in the late afternoon light and we had to slow down to avoid hitting Australian pratincoles roosting on the road. Robert and his passengers encountered a large serpent on the road but it disappeared before its identity could be ascertained. The habitat suggested possibly king brown snake. We had to be careful on the road for to avoid agile wallabies and feral pigs, of which we saw many. We arrived in Musgrave Roadhouse just as the kitchen was closing (7 pm) but a somewhat peeved Trisha had taken the initiative and had pre-ordered our meals. What a bloody marvelous day it had been! We headed back down south a bit this morning as we were meeting the wonderful Sue Sheppard from Artemis Station to look for the rare and declining golden-shouldered parrot. I had arranged to meet Sue at 7 am. As we pulled into the designated meeting spot, some parrots were noticed in the tree overhead. Turns out the golden-shouldered parrots had found us! Both adult males and females were seen but the light was not great and the birds soon moved off. Sue took us across the road to some recently burnt country where she knew the birds were feeding. We soon found them. Quite a few females and immatures were mucking about on a disused termite mound. A party of twenty to thirty birds started bathing in the dew on the leaves of various trees. They were having a grand old time dousing themselves. Both adult male and female and immature birds were seen at this point. They carried on with their ablutions for at least fifteen minutes, followed by a lot of preening, before coming down onto the ground and starting to feed. We had some great looks through the scope at a cracking male feeding on the ground. Overall, we saw about thirty to forty parrots. Sue is doing a fantastic job keeping the small population going that remains on Artemis Station. We turned our attention to other species. We had been hearing red-browed pardalote calling most of the morning and finally tracked one down, Kim was happy as it was on her must-see list. Other species here included silver-crowned friarbird, grey-crowned babbler, olive-backed oriole, white-throated gerygone and striated pardalote, which was nesting. A family group of the delightful white-cheeked form of masked finch was tracked down and we flushed a tawny frogmouth off a low perch. As we were leaving, a magnificent young male dingo came along to see what we were doing. Heading back towards Musgrave we pulled up at a dry creek to see what was about. The creek proved good for gerygone and we had great looks at both fairy and large-billed gerygones. Another good sighting here was a female cicadabird; the female seen far less than the male. The shady creek bed was also full of butterflies and it was a sight to see scores of them all milling about. We took photos and Robert identified them as mainly two-brand crows but with some no-brand crows mixed in with them. Several other species were also present. Well pleased with our morning’s effort we headed back to Musgrave for another of Trisha's lunches. Some of us enjoyed a siesta while others wandered about Musgrave finding plumed whistle-ducks and freshwater crocodiles in a dam behind the caravan park. Eventually we all went to look at the crocs and also saw our first yellow-spotted goanna4 and more black-backed butcherbirds. We then headed east of Musgrave. Not far out some little woodswallows caught our eye at a creek crossing and we pulled over to have a look. This was a good move as it proved to be a hot spot. At a small waterhole both black-throated and masked finches were seen and in the melaleucas nearby we had our first lemon-bellied flycatchers. Some of the melaleucas were in flower and honeyeaters were about. Here we had our only sighting of bar-breasted honeyeater and our first banded and rufous-throated honeyeaters. Golden-headed cisticola was also seen here. So, for the price of a little woodswallow we had half dozen or so really good birds! We pushed on to check out the red goshawk nest site and duly found the red goshawk sitting on its nest. We searched for the mate, which you would expect to see sitting in a nearby tree, but it was not discernible. We had some half decent views of the upper parts of the female on the nest through the scope and that would have to suffice for now. While searching for the male red goshawk we had other good sightings of yellow-tinted honeyeater and diamond dove, both new for our list. Along the road a bit, another fine specimen of yellow-spotted goanna was seen which impressed us by standing up on its hind legs. Another dingo was also seen. We pushed on to Lakefield NP where Trish was preparing a picnic dinner for us at Salt Creek and we had to be there before the night set. After dinner, we spotlighted back to Musgrave. Kim's sharp ears picked up the distant calls of barking owls, which eventually we tracked down and had a good look at one of the pair. We were off to a good start. Not far along road, a tawny frogmouth flew across but did not land in view. Out on Nifold Plain we had a couple of barn owls and a spotted nightjar. An injured snake, which was still very much alive, was seen on the road. We took photos before we euthanized it and eventually had an expert identity it as lesser black whipsnake5. A fair-sized water python6 was also seen, topping off a big reptile day. Another frogmouth was seen on the way home, which proved to be a Papuan. We were tired but happy when we arrived back at Musgrave. It had been a long day but we had had some great sightings. Day 8. Musgrave/ Lakefield NP to Archer River. After our usual breakfast of porridge, muesli and bacon, eggs and tomatoes, we loaded up and headed back out to Lakefield NP as we still had some unfinished business out that way. We stopped at the red goshawk nest but there was still no sign of the male about the nest site. We continued on out to Lakefield where our main target birds were star finch and rufous-banded honeyeater. Out on the plain a few Horsfield's bushlarks were seen and Robert spotted some black-faced woodswallows sitting way out on some termite mounds — both our only sightings of those species for the tour. There were a few cisticola about on the plain so we decided to check them out more thoroughly to see if the zitting, which is known to inhabit these plains, was present. The problem at this time of year is that the zitting doesn’t call much and is difficult to tell from golden-headed when they are in non-breeding plumage. We managed to get one up close sitting on a termite mound and after careful study, we were satisfied that it was indeed a zitting cisticola. It was much paler overall than golden-headed particularly about the face and eyebrows. This was my first sighting of zitting cisticola in Queensland. We continued on to a lagoon where finches like to drink and feed. On arrival we were greeted by a couple of pheasant coucal, one of which looked rather comical running flat out down the track in front of us. As we were getting out of the vehicles, we noticed a large flock of star finches (yellow-bellied form) land in a small bushy tree. It was amazing how a flock of over a hundred birds could hide so well in one tree. The flock consisted mainly of juvenile birds and we had to search carefully to find full-colour adults. Eventually we found some nicely coloured males and got them in the scope. With all the finches and other birds about it was a given that there would be raptors around. A couple of brown goshawks were seen and about four, mainly immature, spotted harriers were in the vicinity. Both brown falcon and kestrel were numerous out on the plains. We went for a stroll up along the lagoons, seeing plenty of forest kingfishers as well as an azure kingfisher and of course lots of rainbow bee-eaters. The tall grass also held golden-headed cisticola and in the clumps of melaleucas, a juvenile brush cuckoo was seen. There was a beautiful species of mistletoe in flower and fruit on the melaleucas and plenty of mistletoebirds were present as well as the scarlet jezebel butterflies for which the mistletoe is the host plant. We were serenaded with the lovely calls of white-throated gerygone and the rather louder but still pleasant calls of both brown and yellow honeyeaters as we walked through the melaleucas. Towards the end of the waterhole we found where the finches were drinking and had the splendid sight of dozens of black- throated, double-barred and star finches drinking and bathing. We still had not seen the rufous-banded honeyeater so we retraced our steps back to the start of the waterhole where the biggest melaleucas were growing. We finally found the rufous-banded as well as a couple of Horsfield's bronze-cuckoo. One of these was an immature bird that had little barring on the breast. Also here, we had, after doing some research, a restless flycatcher. If the distribution map in the new Australian Bird Guide7 is correct, then the so-called paperbark flycatcher only occurs on the western side of the Cape. Personally I question the paperbark flycatcher is a separate species as the differences are infinitesimal. The species is supposedly smaller but every species that I can think of that occurs in both northern and southern Australia is smaller in the north. The paperbark flycatcher was thought not to give the scissor grinder call but recently l heard one give that call in northern Australia. Perhaps a split that needs to go back to the drawing board. This was the only restless flycatcher seen on the tour. Before leaving the plain, we spotted the rogersi race of Australian pipit. Time was getting on now so we made haste back towards Musgrave to a beautiful lily-covered lagoon where Trish had lunch waiting for us. As we ate our lunch to the serenade of a black-backed butcherbird, we added wandering whistle duck to our list and had more green pygmy-geese, radjar shelduck, Aussie grebe and surprisingly, grey teal. We had our final stop at the red goshawk site hoping to see the mate sitting about near the nest — to no avail. He appears to have become rather cunning. However due to it being warm and the middle of the day, the female was sitting quite high up on the nest so we had a nice look at her in the scope. We called in at Musgrave for a pit stop and Robert, who must have had a good morning, shouted everyone an icecream! Our next stretch of road was the roughest we encountered on the whole trip so although the distance was not great it was dark by the time we reached Archer River. Trisha had arrived hours earlier and again saved the day by ordering our meals before the kitchen closed! What is it with these outback kitchens and their early closing! This morning we breakfasted with spotted whistling ducks. The lagoon was right beside our dongas8 and close to where Trisha was preparing breakfast. This was a new species for everyone except me; my having seen it in PNG some years ago. About fifty birds were present along with a couple of hundred plumed whistling ducks. Although not as long in the leg as a plumed whistling duck — hence slightly shorter — they were much more solid in build. They appeared dominant over the plumeds as evidenced by the spotteds often seen pushing the plumed out of the way as they moved about the lagoon. After we had checked out the other occupants of the lagoon, we loaded up the vehicles and headed for Iron Range. At one of our first stops along the road into Iron Range and before we got to Wenlock River, John spotted a couple of bustards flying over, heading south. Our next stop was at a lagoon close to Wenlock River. There were flowering trees here and we encountered more banded honeyeaters. Another red- browed pardalote was seen, clearly showing the yellow rump and vent of race Yorki. Just as we were about to leave, we heard an unfamiliar high-pitched call and looked up to see a pair of palm cockatoos fly over, with a clear view of their red faces and massive bills. Wow what a bird! We continued on to the Wenlock River where we had another stop by the water. Here we had our first tawny-breasted honeyeaters feeding up high in the trees and many helmeted friarbirds were also about. We pushed on to the Pascoe River where we had arranged to meet Trish for lunch. Here we birded the large patch of rainforest while Trisha finished getting lunch ready. It was quiet in the rainforest but we managed to see a female shining flycatcher, varied triller, spectacled monarch, fairy gerygone and our first grey whistler (race peninsulae) with the breast and vent tinged yellow. The UHF radios crackled that lunch was ready so we curtailed our birding. White-streaked honeyeater, which resides in the heathy scrub with flowering grevilleas mainly east of the Pascoe River, was our main objective after lunch. We located a few on our second attempt and had half decent views. More brown-backed honeyeaters were seen here as well. We stopped again in some heath further along and had even better views of white-streaked honeyeaters. A spectacular tree with bright yellow flowers was seen as we neared the Iron Range as well as a very pretty melaleuca with dark red flowers. We stopped at the first patch of rainforest we came to at Iron Range to see what birds we could extract in what remained of the light. We did surprisingly well as we managed to get good looks at a couple of trumpet manucode in the treetops. A yellow-billed kingfisher called here as did magnificent riflebird but we were unable to locate them. Our first pair of red-cheeked parrot flew over. We had a brief look at a white-faced robin and down by the river in the bamboo we had our first tropical scrubwrens. We had done well on our first birding in Iron Range and I was pleased with the manucode as they can be a difficult bird to see. Calling it a day we headed for our cabins near Lockart River Airport. As we were leaving the cabins after breakfast a couple of palm cockatoo were seen flying off into the distance. We had not gone far down the road heading for the rainforest when someone spotted a Papuan frogmouth roosting low down on some dead branches right beside the road. I thought there was something wrong with it initially as it was so low down and so close to the road. However, when we pulled up it flew a little further back off the road and seemed fine. It was a great to see one up so close. We continued on towards Cook’s Hut campground. Along the road we had our first brush turkey with the purple neck pouch, race purpureicollis, looking particularly fine. We had barely got into the rainforest when several manucode flew across the road. We decided to pull up and see what else was about. This proved productive as in a very short time we saw our first yellow-billed kingfisher. What a bird! Soon after, we had green-backed honeyeater and rufous fantail working together in some sort of feeding partnership; they were continually following each other around. We had to work on the green-backed honeyeater for a while before everyone had good views. The magnificent riflebird was also calling close by and after some effort, I think everyone had a nice look at the male. Iron Range can be a notoriously difficult place to see birds at times, yet here we were doing so well on our first morning. Next up we had the frill-neck monarch, another glorious bird. Other species seen included grey whistler, little shrike-thrush, silvereye and spectacled monarch. Things were starting to slow down a bit now. We had not had a new bird for al least five minutes so we decided it was time to move on. Near Cook’s Hut campground we saw another frill-neck monarch. We spoke to a birder there who told us about a spot he had seen northern scrub-robin so we checked it out as that was one of our most wanted birds. We did not find the scrub-robin but we did find another yellow-billed kingfisher, which was even lower down than the first and we had cracking views. More green-backed honeyeaters were also seen, again in company with rufous fantail. Our last stop for the morning was at the eclectus parrot nest tree where the female was looking out of her hollow at us. What a great end to the morning! We headed back to the cabins for lunch followed by a post-lunch siesta. At least some of us had a siesta. Robert and John went off to check out the spot where the scrub-robin had been sighted. They reported back that they had heard but not seen it. We decided to have a go for it although the vegetation was very thick and the chance of seeing it not great. We tried for an hour or so but it wouldn’t leave the thick undergrowth. Robert turned over some old sheets of tin at what was probably from an old army site. Under one sheet of tin a Melomys, a native rat, was in a nest with two small young clinging to her. Going on the habitat and situation, it was probably a grassland melomys. (The grassland and fawn-footed melomys are not easy to tell apart). A gecko with spots was also under a sheet of tin but couldn’t be identified from my poor photo of it. After another of Trisha's excellent dinners, we went out for a spotlight. Our main quarry tonight was marbled frogmouth but there were plenty of other possibilities. We started off well with a couple of Papuan frogmouth. Next up was large-tailed nightjar but it was a bit flighty and got away before everyone had an adequate view. We found a suitable spot for the marbled frogmouth and heard several calling. With some persistence we closed in on one and had great looks at this glorious bird. While we were ecstatic, there was more to come! We continued spotlighting along the road and after some effort a southern common cuscus Phalanger mimicus was spotted in the treetops eating a large fruit. At one of the creek crossings there was a huge splash and a swirl of water as we had surprised a saltwater crocodile only a few metres from us in the creek. It was not massive, only a couple of metres and I think it got a bigger fright than we did! Our next sighting was another large-tailed nightjar but this one sat for us. Another water python was seen crossing the road a bit further along. What a night we were having but there was still more. Back towards the airport more Papuan frogmouths were seen. As we were watching one, Robert noticed some eyeshine up in a eucalypt. We got the lights on it and it was a striped possum. It really looked quite different from the striped possum we had seen back on the Tablelands with much less contrasting markings on the back and more white in the tail. What an end to a fantastic night spotlighting! We had a slightly later start this morning after the previous night's excitement. While still around the cabins, we saw a fawn-breasted bowerbird fly in and a little later a group of five was located feeding in the freshly mown grass around the airport. We had great views of this often difficult to get species. An Australian hobby was also seen near the airport; so much darker than our hobbies in the south. Birds still on our wanted list included yellow-legged flycatcher, northern scrub-robin, red-cheeked parrot (only poor flight views had been had), black-eared catbird9 and chestnut-breasted cuckoo. We also wanted to see the local race of double-eyed fig parrot10 plus get better views of palm cockatoo and eclectus parrot. Of course any overwintering red-bellied pitta or black-winged monarch would also be welcome! We headed back up around Cook’s Hut hoping for to see any of our 'no more piece-a-cake birds’. A pair of grey-phase grey goshawks was spotted in some open country soon after we left the cabins. We stopped near the eclectus parrot nest tree to see if they were about but not much was happening there. However, Susanna had a major find when she noticed a common spotted cuscus Spilocuscus maculatus roosting down quite low in a tree. Wow what a cute creature! We now had both cuscus species. We tried a couple of spots were I had had yellow-legged flycatcher in past years and (due to Robert's good hearing) at the second spot we came up trumps. Persistence rewarded us with good views of this quite difficult endemic. One of our most wanted down! Other sightings of note this morning included wompoo fruit-dove, green-backed and tawny-breasted honeyeaters, yellow-breasted boatbill, yellow oriole, frill-neck monarch, trumpet manucode and metallic starling. We also had our best views yet of the delightful white-faced robin and we also saw our first bare-backed fruit-bats Dobsonia moluccense. We headed back towards Lockhart but stopped again at the eclectus nest tree and this time luck was with us. There were about five birds present and we had cracking views of both male and female in the scope. We headed back to the airport for lunch. It’s so good after a hard morning in the field to have lunch waiting for you when you get back to base! After lunch we tried another spot for the scrub-robin. We had another calling quite close but it was very thick and we never really looked like having a sighting. We tried some other rainforest in the afternoon and had another pair of red-cheeked parrots come out of a tree quite close to us. Also a double-eyed fig parrot was seen close in flight. We headed back to the cabins for dinner. This was our last full day at Iron Range and we still had a few birds to get. Our first lucky break came at the cabins when the palm cockatoos did their regular flyover in the early morning. Robert saw one of them land in a tree and eventually we got it in the scope. Next up we had another go for the scrub-robin but it still was not co-operating but we did see a pair of lovely fairywrens. We headed up to the rainforest about Cook’s Hut and located a fruiting fig tree along the road where there was a lot of activity. The fig tree was mostly full of figbirds but we enshrouded ourselves around the base of the tree and kept watch. A few minutes later several barred cuckoo-shrikes appeared. Next was a party of trumpet manucode and we had our best views yet of this extraordinary bird. Metallic starlings were also seen and Sue was lucky enough to see a male superb fruit-dove. We were hoping for the catbird but none was seen or heard. We pushed on. Eventually we tried another track going in behind one of the camping areas. Here we had more wompoo fruit-doves, white-faced robins, black butcherbird and another male magnificent riflebird. Finally, we heard a chestnut-breasted cuckoo call and managed to track it down. Wow what a beautiful bird! Back to the cabins for lunch followed by a rest, after which we headed across to Portland Roads. We were dining at Out of the Blue Café tonight and spotlighting our way home. As we drove through the rainforest a beautiful spotted shiny goanna was seen that I believe was a mangrove goanna Varanus indicus, which despite the name does live in rainforest as well. We had our first rain at Iron Range on the way over to the Portland Roads settlement. On arrival, we birded the mangroves hoping for red-cheeked parrots, which I used to see regularly here back in the 1990s but not this time. The mangroves were heaving with rose-crowned fruit-doves calling everywhere. Down near the foreshore we had a greater frigatebird go over and both collared and azure kingfisher were seen as well as both white and grey phases of reef egret and our first varied honeyeaters since Cairns. Trish and Jacqui headed back to Lockhart River after dinner and we started spotlighting. 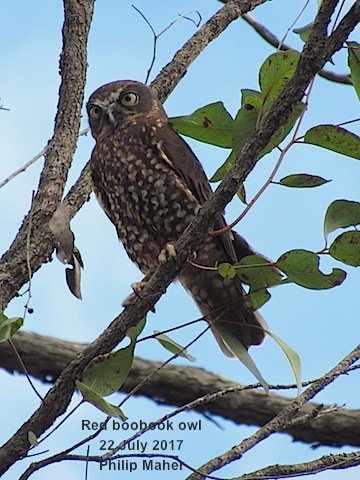 We soon saw our first Papuan frogmouths and then a little further along our first large-tailed nightjars. By the time we got back to Lockhart near ten large-tailed nightjars had been seen. This was only about half what we used to see in the 1990s but way more than we have been seeing the last couple of years. A small serpent with a dark head was seen on the road but it made its getaway before we could get a decent look or photograph. Also a frog was seen that made leaps of at least a metre, which I believe was a rocket frog Litoria nasuta. Generally, the spotlighting was pretty tough going. There didn’t appear to be many reptiles about; maybe it was a little cool for them. We worked hard in the rainforest for more cuscus but none was forthcoming. There are either very few there nowadays or they have become light shy. In the 1990s we’d have multiple sightings of both species. A few more Papuans were seen but nothing else of note. Sadly we had come to our last morning at Iron Range. The Range had been good to us, revealing most of her treasures. As we left the cabins, a pair of lemon-bellied flycatchers was sitting on the fence. We headed into town to see if we could get a close look at a palm cockatoo. They are often about the town feeding on large nuts in the street trees. There was just a single bird feeding on this occasion but we did get a nice view. Robert dropped Sue up near the ranger station to look for the catbird while we made an all out effort to get the scrub-robin. As we entered the rainforest we eyeballed yet another yellow-billed kingfisher. This one was up close, only five metres or so away at eye height. We worked on the scrub-robin for about an hour and our persistence finally paid off. We had a much better chance of seeing it once we realized that it wasn't calling from the ground but a couple of metres up in the low branches! That's what its closest relative, the southern scrub-robin often does, so I should have known. We had cracking views and for me, and I'm sure for others, this was the bird of the tour. Out on the road we heard a Gould's bronze-cuckoo call and tracked it down. We had heard a few calling on the tour but this was our first actual sighting. We went back to see how Sue was faring but she had no luck with the catbird, one of her three target species. Returning to Lockhart River township, we checked out the beach. Spectacular giant round boulders sit out in the water here. We had a couple of gull-billed and crested terns and some silver gulls but not much else. We checked out the sewerage ponds and had quite a few birds including welcome swallows (our first for Iron Range), grey-shrike-thrush, white-winged and varied trillers, helmeted friarbird as well as dusky and lots of white-throated honeyeaters, red-backed fairywrens and Aussie grebe. We also saw our first buff-banded rail for the tour and a lesser frigatebird flew over. So two new trip birds were added. Nearby, a pair of osprey was nesting on a tower. As we drove back to town, a Brahminy kite flew over and in town another fawn-breasted bowerbird was seen. Our entire group had taken up the offer of a ride back to Cairns at the end of the tour rather than take a flight out of Lockhart River so after lunch we headed for Archer River, elated with our time at Iron Range. It had been a hot, humid day, the hottest it had been since we arrived, but an ideal temperature for reptiles. Not long after we’d left the rainforest, out in the heath country, a very large serpent crossed our path. It could have been a python it was so large. It was a couple of metres long and quite wide in girth. From the coarse scales, you could tell it was a venomous snake. The pale face indicated taipan. It showed no sign of aggression and only wanted to get out of the way but it did have a menacing look about it and I wouldn’t have liked to have got in its way..
Back towards Archer River, we started seeing species we had not seen for a while, such as pale-headed rosella, red-winged parrot, Torresian crow and galah. The galahs here are much different to ours in the south, being much paler pink and with a red eye ring. The juveniles are very pale. We arrived at Archer River in good time. Trisha had made good use of the leftovers and knocked up a meal for us. It was a long drive today on a rough road, so we didn’t have a lot of time for birding. We said goodbye to the spotted whistling ducks at Archer River. Not far south of Archer River a pair of Pacific baza was spotted from the road, our second sighting for the tour. We had a brief stop at the Coen River just outside Coen where a lot of melaleucas were in flower. The melaleucas were attracting lots of little and silver-crowned friarbirds and white-throated and a few brown-backed honeyeaters. John found for us no less than three cicadabirds, two males and a female. We pushed on. The real bone-rattling stretch of road was coming up between Coen and Musgrave. Lunch was to be had east of Musgrave not far from the red goshawk site. This was our last chance to see the male. Once more he proved elusive and again we only saw the female on the nest. Trish had lunch set up at a dam that proved to be birdy. There were quite a few of the white cheeked form of masked finch coming in to drink, as well as black-throated finch and of course, lots of white-throated honeyeaters. South of Musgrave Robert spotted a black-breasted buzzard, a first for the tour. It was low down over the trees and we thought it had disappeared before everyone had seen it but it came up across the trees once more and I think everyone had a view of this distinctive raptor. Back at Lakefield we had a nice look at a red-backed kingfisher on the wire and several bustards were seen in a melon patch. We arrived at Kingfisher Park not long after dark and Jacqui’s husband, Rob, was waiting to collect her. We said goodbye to Jacqui and headed up to the Highlander Inn for dinner. Day 15 Kingfisher Park to Cairns. Trish did our last breakfast, whipping up a batch of American pancakes for us along with the usual breakfast fare. Some of the troops ventured down to look for red-necked crake but didn’t have any joy. It’s a difficult bird to see these days. We had a hectic couple of hours, offloading leftover food with Andrew and Carole at Kingfisher Park and packing all our gear back into our three eskies and our bags — my least favourite part of any tour! It is entirely possible that we carry more gear than any other bird tour group on Earth! Gear loaded we headed for Cairns to drop the group at their various locations. Robert, John, Trisha and I dropped the three hire vehicles back to Meteor and 1300Truck Hire, checked our 150 kg or so of luggage and eskies through and arrived back to a chilly Melbourne at about 10.30 pm. The tour would not have been the success it was without Robert’s enthusiasm and birding prowess and the good company and keeness of John, Susanna, Kim, Sue, Jacqui, David and Jeannie, and Jim on the Atherton Tablelands part of the tour. We thank you all.